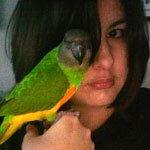 Parrot Forum • View topic - Is not taming/training your parrots lazy? Is not taming/training your parrots lazy? Do you think it's lazy to not try to tame your parrots? Maybe some people aren't into teaching tricks. I understand rehomed parrots have issues and they are an exception. I can never understand some people online who write about their parrots being completely "wild" and are completely satisfied with not making any effort to have a basic bond with them. Is it possible to take care of a parrot properly without basic taming? Re: Is not taming/training your parrots lazy? So really what you are asking is a two part question. 1) Is taming and training a parrot mandatory for the parrot's well being. 2) If it is mandatory, is laziness a compelling reason not to do it. Hmmm... depends on how far you are taking the training. I have not trained my parrots to do any tricks. They are tame though. I guess they have been inadvertently trained by me to do basic step ups and downs. Beyond that they are free to do as they please. What they really want to do is be on me and get scratches. I wouldn't call my lack of training them tricks lazy. I have 4 birds, all vying for my attention, and I work. I don't really have time to train them even if I wanted to. I also didn't get parrots to perform tricks on command. I got them for companionship. That said, I wouldn't mind figuring out how to train them to maybe play dead... that trick is awfully cute! Also, Pippin (senegal) really needs to learn to not climb on my head. We really struggle with that one. Oh! Just remembered... I've been working on potty training, which is training... but I've not been consistent so it isn't working too well. I don't mean tricks. I realize some people don't teach tricks and that's okay. I really mean basic things like step up, maybe targeting, being able to hold your bird in your hand, and being able to check your bird's wings. Ah, well in that case, I don't see how you could even have a pet bird without basic training such as step ups etc. There has to be some basic commands learned in order to have a good relationship with the bird. If you can't be bothered to teach very basic commands then you probably shouldn't have a pet parrot. I know... it's so terrible. I have seen so many cases of neglected birds in the time I've worked at the pet store. People buy these birds and then grow tired of them, leave them in their cages and then bring them to us to sell on consignment. The birds are usually terrified of people by the time they come to us and require a lot of patience and time to get back to pet status. It's so awful. I just don't understand people sometimes. I reckon most of the poeple with either , or , would try to train for a peroid of time, if the brid do respone well, they would give up and let the bird in the cages, because the brid is realitive smaller and most of the time with planty of space in size the cage, people don't feel gulity when leaving smaller bird in the cage.